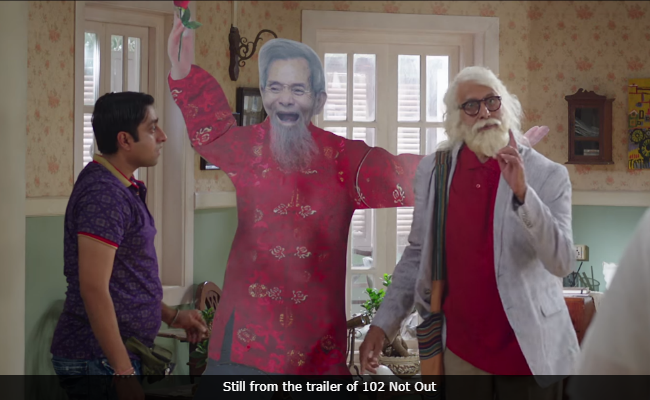 102 Not Out Movie Review: It's is about an old man who wants to get older. It's sweet and harmless, but essentially rather boring. An asterisk at the end of a scoreboard is a wondrous thing, hailing the batsman safe even as the innings wraps up. It is a mark not merely of being 'not out' but, to use the dramatic cricketing term, 'unbeaten.' Carrying one's bat signals valour, but while supporters of the batting team have much to cheer, it is important for us to remember that those on the opposing end look at this very performance as a dull slog. The centurion here is a spirited old coot who has picked the mission to rejuvenate his colourless son, aged 75. Based on a play of the same name by Saumya Joshi, Shukla's film is a sweet but dull enterprise, one that never quite rises above its ultimate ambition: that of having two legendary actors play off each other. Amitabh Bachchan and Rishi Kapoor are stalwarts wily enough to bat out any pitch, but this cloying and simplistic film doesn't challenge them at all, even though they are frequently foxed by the Gujarati accent. Kapoor, as Babulal Vakharia, is a former mathematics teacher - a grump by profession, I daresay - who likes his curtains the way they are, and can only sleep wrapped up in his childhood blanket. Dattatraya, his enterprising and animated father, played by Bachchan, compels Babu to change his habits and discard his coping mechanisms. 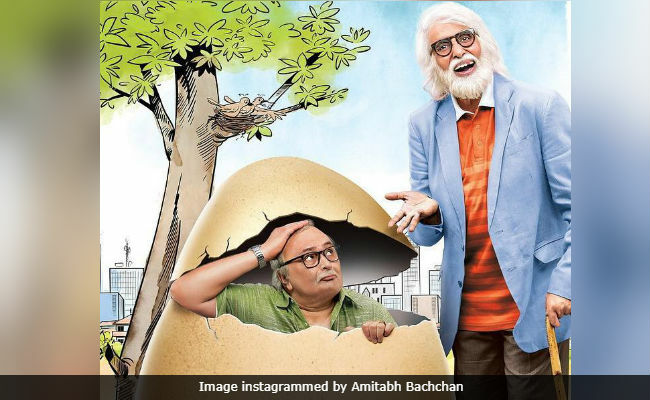 There is more than a touch of insensitivity in the way the old man goes about expressing his tough love, and were it not for the twinkle in Bachchan's eye or the way he makes gummy teeth look like bubblegum, this may have been a very different film. There is nothing wrong with the grand old man's motives, of course, but his methods are rather sledgehammerly. 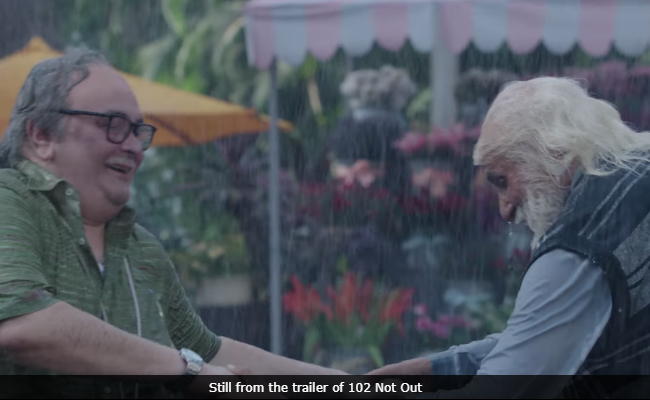 We begin with Datta asking Babu to move into an old-age home because, he reasons, Babu's droopy demeanour will rub off on him and affect his innings: he wants to be the world's oldest man, and, in his words, he has "only sixteen years to go, yo." Babu, used to scowling in a room that doesn't change, panics and pleads to be left where he is, to which Datta gives him a series of very specific tasks - from writing a love letter to growing a flower - designed to bring him alive. This he does, and the film chugs along with feelgood strength, like a ten-minute scene from a Raju Hirani movie stretched into an entire feature. The film feels basic and is short, at an apt 102 minutes, and there are a few nice touches: the way Bachchan stands ready with a towel when his son is out getting drenched in the rain, the way Kapoor is irked by his father's need to sing along with every bit of a song - "ab ladies part bhi gaayenge aap? ", he bristles - and the way the words "I hope you understand" are impressively given short shrift. It's also lovely to have the father refer to the son as Babu, something that happens in India regardless of what the son is named. The primary issue is that 102 Not Outis too static. This lack of dynamism is both physical - with the Vakharias cooped up inside their bungalow for most of the film, giving away the film's theatrical origin - and emotional, since the film never goes anywhere, except for the older man becoming more and more overt in his emotional manipulation, something that may also be said for Shukla. The theme of parents and sons clearly resonates with the filmmaker, his last film being the ill-conceived farce All Is Well where Kapoor starred as a caregiving husband with Abhishek Bachchan as his estranged son. 102 Not Out is, as I said, a sweet film. It's nice to see an old Bachchan picture on the wall, circa Abhimaan, just as it is fine to see a photograph of a Khel Khel Mein Kapoor teaching his son math. 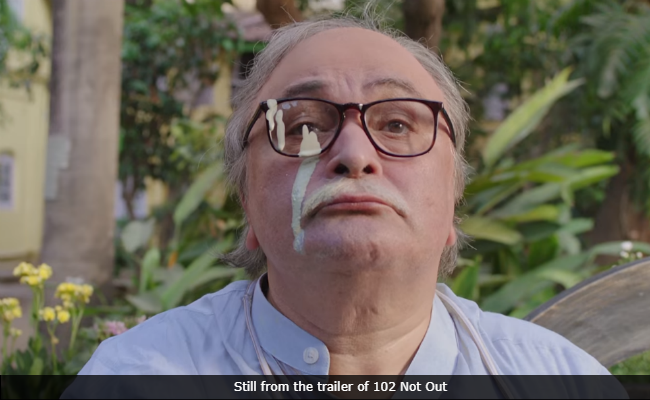 Yet despite Bachchan and Kapoor - and young Jimit Trivedi, who plays the enthusiastic domestic help with infectious enthusiasm - the film relies too heavily on prosthetics, with liver spots being used either for laughs, or instead of character details. All we ever know about Dattatraya is his decrepitude. For a film about living a full life, that feels rather toothless.